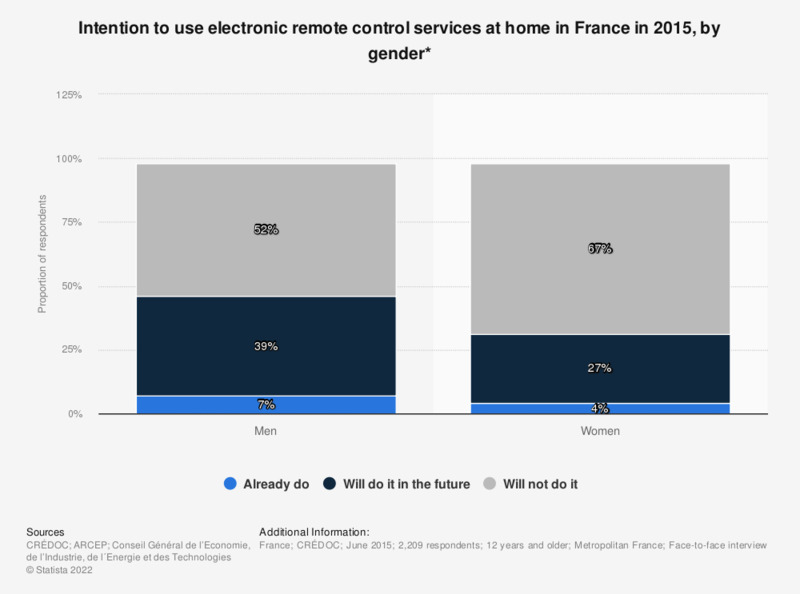 This statistic illustrates the results of a survey conducted among French people in 2015, concerning their interest in the remote control services (by telephone or Internet) of electronic devices at home (shutters, heating, alarms, etc.). The results of this survey show that a larger proportion of men than women (about 40 percent versus 27 percent) planned to use this type of service in the future. * Home automation systems: systems allowing remote control of services (lighting, heating, air conditioning, etc.) at home. The question was formulated by the source as follows: "Today, it is You can order remotely, by mobile phone or internet, electronic devices that are at home while you are not there (security system, heating, shutters and windows, etc.). Do you think that in the future you will use this kind of services? The missing percentage points correspond to people who have not pronounced.